Roseville Fire Dept. 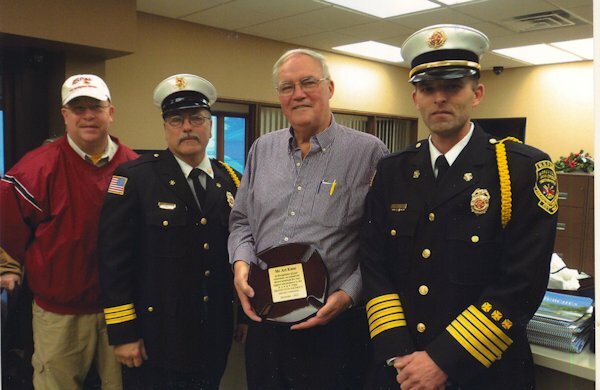 trustees from left: Todd Adkisson and Greg Livermore, (Art Kane) and Fire Chief Jeremy Wise made a presentation to Kane at his Raritan State Bank retirement open house. Kane was recognized for his dedication and service as a member of the building committee that donated countless hours to the design of the new Emergency Services Building in Roseville. Now, the R.S.P.&E. Fire Protection District shares office area and common space with the Roseville Fire Department and the Roseville Area Ambulance Service in its own separate secure and functional setting. January 22, 2012 over 375 people attended the R.S.P.& E. Open House and Dedication Ceremony thanks to Kane and those who helped to make this a reality.